The Fotodiox Fujica 35 to Fujifilm X Lens adapter allows you to place your favorite Fujica 35 lens on your Fujifilm X body. This adapter gives you the ability to use your irreplaceable prime lens and saves you the cost of purchasing new lenses. 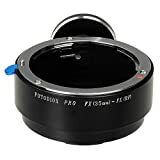 The adapters are precision made to insure the perfect fit.The lens will fit physically, but the automatic diaphragm, auto-focusing, and other functions will not operate correctly while using this adapter. In this case, “stop-down mode” will need to be used when metering, since the lens does not have the ability to have its aperture controlled by the camera body. You can shoot in manual or aperture priority mode. Infinity focusing is guaranteed. This entry was posted in Discount Photography and tagged 35mm, Adapter, Body, Camera, Fotodiox, Fuji, Fujica, Fujifilm, FX35, lens, Mirrorless, Mount, XMount, XSeries by Ball Photo. Bookmark the permalink.